Our Great Pyrenees enjoy a cozy nap in the barn, but they take their guardian job very seriously. They’re always on the watch for coyotes and other predators, and they patrol all night long. With their thick coats they hardly feel the cold, even in a snowstorm. 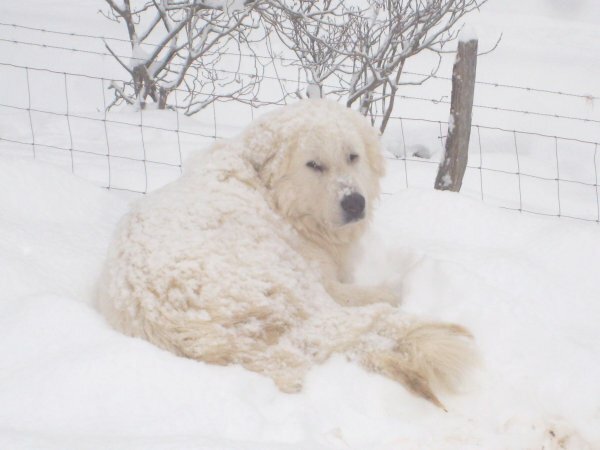 We’ll often come outside on a snowy morning and find the barnyard full of dog-size piles of snow, each dog curled up with its nose tucked into its bushy tail.